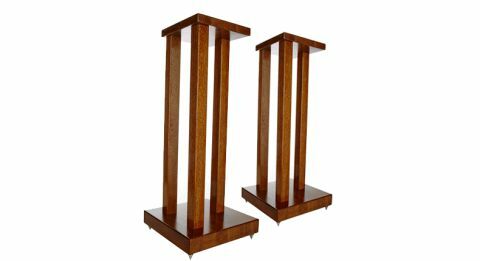 Hi Fi Racks Podium Slimline Speaker Stands review | What Hi-Fi? We like the warm, full-bodied and gentle sound that these slim wooden stands bring out of our reference ATC SCM 11 speakers. We’re less fond of the slightly tubby bass and fuzzy edges, though. Play a Norah Jones CD and these Hi-Fi Racks stands suit the languid pace and sweet vocals – it’s such a comfortable listen. The presentation is open and airy, but we’d like more precision and tight bass to get us through the attacking rhythms of an Iggy Azalea track. You have the choice of 50, 60 and 70cm stand heights to get your speakers at the right ear level. In the standard oak finish, the Slimline stands will cost you just £100. Opt for our review sample’s glossy mahogany finish (or the black, walnut and cherry options), and you’re looking at spending £120 for the pair. They’re also surprisingly light, so make sure the legs are tightened and floor spikes are adjusted for maximum rigidity. Any unevenness can affect the overall sonic performance of your speakers, and you don’t need the sound getting any more relaxed.